During World War II, two African American musicians are captured by the Nazis in Paris and imprisoned at the Buchenwald concentration camp. BERNICE L. McFADDEN is the author of nine critically acclaimed novels including Sugar, Loving Donovan, Nowhere Is a Place, The Warmest December, Gathering of Waters (a New York Times Editors’ Choice and one of the 100 Notable Books of 2012), and Glorious, which was featured in O, The Oprah Magazine and was a finalist for the NAACP Image Award. She is a four-time Hurston/Wright Legacy Award finalist, as well as the recipient of three awards from the BCALA. McFadden lives in Brooklyn, New York. 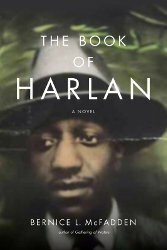 The Book of Harlan, her latest novel, won the 2017 NAACP Image Award for Outstanding Literary Work, Fiction and an American Book Award.